On May 16 2012 the House Subcommittee on Communications and Technology held a Hearing on Broadband Loans and Grants, aka BTOP. 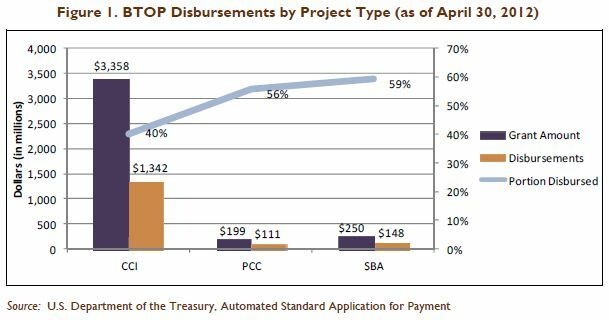 As can be seen on the chart, infrastructure projects – many held up by environmental or other permit concerns – are lagging in fund uptake. Some may even miss the deadline (Sep 2013). The Q&A focused on overspending and fraud on the Dem side, and more existential questions from the GOP side.